Access is Microsoft's popular, pseudo-relational database platform. Note: Microsoft cautions against running any program in its Office suite as a Windows Service. However the most notable problems arise when running in the LocalSystem account and AlwaysUp can get around that. Nevertheless, please be sure to thoroughly test your setup to ensure that Access works as expected. Install and configure Access 2007, if necessary. Please make a note of where you installed it as this will be used in a later step. In the Arguments field, enter the full path to your Access database file (*.ACCDB/ACCDE/MDB). 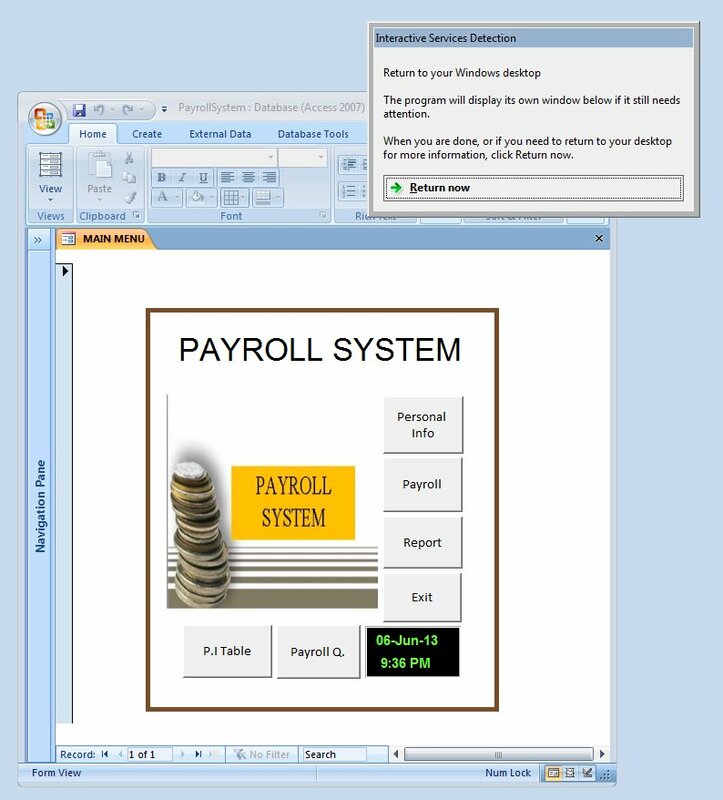 For this tutorial we'll use this freely available Access payroll system, which we have placed in C:\Access\PayrollSystem.accdb. Be sure to enclose the path to your file in quotes if it contains a space! Note that Access supports several command line switches and you can add those as arguments here as necessary. For example, you can pass a user name and password if your database is protected, etc. In the Name field, enter the name that you will call the application in AlwaysUp. We have used Access DB but you can specify almost anything you like. Click over to the LogOn tab and enter the user name and password of the account in which you installed and configured Access (or Office). Access 2007 must run in this account so that it can find its settings. Click the Save >> button. 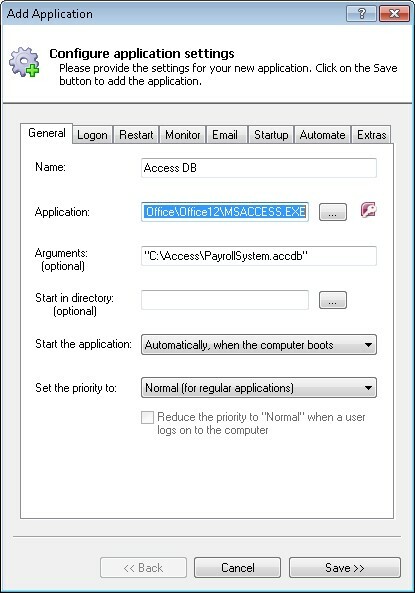 In a couple of seconds, an application called Access DB will show up in the AlwaysUp window. It is not yet running though. 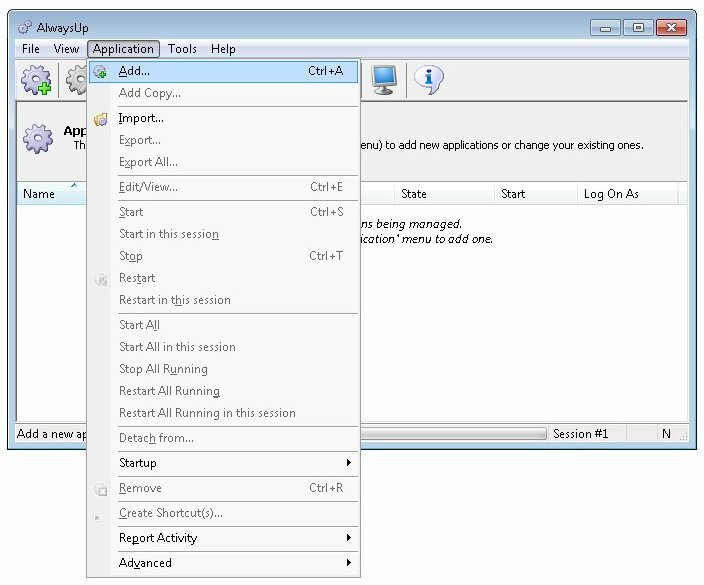 To start your application, choose Application > Start "Access DB". In a few seconds, the state should transition to Running. That's it! Next time your computer boots, your Access 2007 database application will start up immediately, before anyone logs on. We encourage you to edit the entry in AlwaysUp and check out the many other settings. For example, add a delay on the Startup tab if Access must wait for other applications to start at boot, or boost the priority to give Access more CPU. Access 2007 not working properly as a Windows Service? Running Access in the background unattended can be tricky, especially when it throws up a prompt that interrupts the action. If these can not be eliminated you may want to investigate using an automation script/program to automatically dismiss the pesky windows. Please see the Automate tab (or the AlwaysUp User's Manual) for additional information on automation.